"I find that to keep thinking about our problems beyond a certain point is bound to create confusion and worry. There comes a time when we must decide, and act, and never look back." Drapes too short? Ceilings too high? It's a great idea to hang drapes as high as possible to make the ceiling look higher. What do you do when you can't buy pre-made drapery panels that are long enough? Buy fabric and have someone sew a coordinated border onto the bottom of the pre-made panels. This is such a simple sewing project, you can probably get a dry cleaner to do it for you. I've also been known to use two- sided tape! Sandy is my Executive Assistant who does a great job getting Graduation Certificates out to you in a timely fashion, keeping the Staging Diva Network humming and many other behind the scenes details. Don't worry, I'm still accessible but with over 200 emails a day, I need help! Where do those staging projects come from? In recent months, I've advertised over 100 home staging projects that are available for Staging Diva Graduates all over North America and even in England and South Africa. I hear about these projects because of the high number of visitors to my two home staging websites and all the publicity I get in major media. 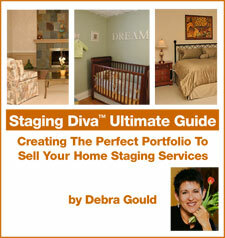 Homeowners and agents are asked to first look for a stager in the Staging Diva Directory of Home Stagers. If they can't find anyone, they use the Staging Diva Home Stager Locator Service. The important spring real estate market is well underway and now is the time to get your portfolio online so clients can find you. I'm still waiting for some of you who purchased listings to submit your text and photos. Don't wait, you're missing the spring market! Please send your material in a series of emails once it's all prepared and organized. Don't send bits and pieces over a number of days or weeks. It's up to you to get it all organized. Consider it practice for your client projects. What training is right for you? Anyone can call themselves a professional home stager, there are no course requirements or licenses to do so. Consider your own strengths and weaknesses. Decide exactly what you need to get out of a program and then find training that specifically offers that. Look for a trainer that has a proven track record of success in whatever they're going to teach you. Otherwise, what proof is there that their methods work in the real world? Look for evidence that there's a genuine interest in sharing real information with you and providing ongoing support for your growth. If it's all about "selling a course" then don't expect anything else once you're a paying customer. If student comments or testimonials have no full names, no photos and no way to locate them, how do you know the testimonials being quoted are real? No single training program will be right for everyone! But you owe it to yourself to research your options and choose wisely, based on your specific needs. Thanks to all of you who wrote wondering why you hadn't heard from me in awhile! It's great to know you value the content of these newsletters! It's been very hectic since the last issue. My new book "The Staging Diva Ultimate Guide: Creating the perfect portfolio to sell your home staging services" came out in March. With the amazing leadership of Sandy and Peggy who spearheaded the project, we launched the new Staging Diva Locator Service and Home Staging Project Referral Service. I hosted a 90 minute Staging Diva Preview for over a hundred aspiring stagers, staged several houses, traveled for March break and did all the stuff that single Moms do to keep their homes running and kids happy! Wow the spring real estate market is hopping! I'm fully booked with staging projects for the next 4 weeks so I'm referring all my own clients to Staging Diva Graduates (if they have a website or a page on the Staging Diva Directory and I know they're able to handle new clients). I've also been referring dozens of projects to Staging Diva Graduates all over North America, including a project for one of the Graduates in England! You'll find projects posted at The Business Of Home Staging with instructions there for how to be considered for any of them. It's been a busy time building Profile pages for new listings in The Staging Diva Directory of Home Stagers. If you want a quick way to see the approximately 60 listings, scroll down to the bottom of the sign-up page here. Where do projects come from? Imagine you decide to have a party to launch your business. You spend days researching the best location, choosing the decor and food with care, maybe you even hire a catering company. You send out thousands of invitations to the big event. As the date draws closer you imagine all the new clients you'll meet and how your new business will take off. Now imagine nobody comes to the party, except your parents and closest friends. What a waste of energy, money, time... the dashed expectations are awful, not to mention how it will slow down the success of your business! That's what it's like when you hire a designer and they build a beautiful web site and nobody visits, except your friends, family and the people who already know about you! One reason web sites are so important for building your staging business is that people who are already interested in staging search the Internet to find stagers to help them. But, it's not easy getting your site found, after all there are millions of home staging websites! Ensuring search engines find your site is a huge topic that I continue to take courses in and devote considerable time to. After all, that's how you found me! That's also how 90% of my home staging clients find me when it's time to stage their house. The way he built her home staging website, there is absolutely NOTHING for a search engine to find. Her site is almost completely invisible except for the line that appears on each and every one of her pages that says, "Site built by hisname" with a link back to him! I know her site is invisible to search engines because I looked at the code! Search engines don't read websites the way humans do. We read the text and look at all the pictures and the nice layout. Search engines only read the computer code that's behind each web page. Before you hire anyone to build your site, make sure they know how to write the code so that it's visible to search engines. Tell them not to use "flash" or "frames," which are ignored by search engines. When you join the Staging Diva Directory of Home Stagers, I do the work of making sure your page is found based on the courses I've taken in this subject and the 7 years practice I've had building my own websites! This topic is covered in greater detail in the Staging Diva Training Program. The new Staging Diva Home Staging Project Referral Service is designed to make it easier for you to apply for home staging projects you see advertised on The Business of Home Staging. It's the nature of the home staging (and any service) business that not everyone who contacts you will actually hire you in the end. Sometimes it's "you", but often it has nothing to do with you at all! The trick is not to let temporary disappointment keep you from continuing to move forward. To become stronger at "sales" it's important to look at every rejection as an opportunity to learn something. Part of the learning is realizing that you can't take all these false starts personally! "To keep you updated. Karen decided to list the house without any staging or furniture rental. Thanks for the referral though, it forced me to do my research. Now I am aware of what is available, the price of rentals and how their services work." You can read about new home staging projects anytime under the category Home Staging Help Wanted, and apply by using the new Home Staging Project Referral Service. Worried about missing an opportunity? Sign up in the green box in the left column to have my posts automatically emailed to you. You must follow the instructions provided for how to apply for a project, otherwise you won't be considered for the opportunity. If I've sent you a number of project leads and you haven't kept me informed of whether they turned into projects, you're unlikely to receive future referrals. Do not misuse this system by making up fake projects to learn about stagers in your area! This wastes everyone's time and is very unfair to the stagers involved. If you're interested in finding out about stagers because you want to start your own staging business, do some research! If you can't find stagers in your area that tells you they don't exist or they're doing a poor job of marketing themselves. Meaning, you shouldn't worry about the competition! Whether your "portfolio" is a photo album, Profile page on the Staging Diva Directory of Home Stagers or your full website, how you present yourself is the single most important factor in determining your success. With worksheets and plenty of "how to" information this guide will show you how to get out there and win business. Over 100 pages of specific steps to improve your writing, photography, logo, presentation and more! Congratulations to Cheryl Reynen of Set the Stage on doing a public seminar on staging sponsored by Coldwell Banker. She's been taking lots of action to get her name out there since taking the Staging Diva Program in January. Way to go Cheryl for stepping out of your comfort zone to promote your business! This will really boost your profile! Congratulations to Staging Diva Graduate Colleen Ernewein of Home Impressions Staging and Decorating who created a "Does Your Home Need A Makeover?" seminar. Public speaking, and the promotion of the event are great marketing techniques discussed in course 4. And guess what? Colleen got a radio interview on a local AM radio station and an invitation to be a guest speaker at a Prudential Real Estate seminar. Congratulations to Caireen Kennedy of Red Shed Interior Solutions on doing such an awesome job on her new logo and copy for the Staging Diva Directory of Home Stagers! Congratulations to Peggy Depalma of Sanctuary Solutions who within months of completing the Staging Diva Program already had a feature lined up with North Of The City Magazine. Congratulations to Graduate Amy Eastlack of Staging Solutions and Redesign for joining the Staging Diva Directory and for being featured in an upcoming article in the Midtown Omaha Newspaper. It's worth noting that all these graduates have either a profile in the Staging Diva Directory of Home Stagers, their own website, or both. There is no better way to let customers and the media find you! Watch for my interview on home staging in the August or September 2007 issue of Better Homes and Gardens. With any luck they'll keep in the part about the Staging Diva Directory of Home Stagers. Either way, this article will generate significant traffic to the Staging Diva site as readers go there to learn more about home staging and how/why it works. This one magazine has a circulation of over 38 million! And, 81.5% of their readers are homeowners. When you consider at least 10% of the population moves in any given year, that's about 3.1 million homes that will potentially hire a home stager if they know how to find one! To buy even a small ad in Better Homes and Gardens costs hundreds of thousands of dollars. The value of being part of the editorial content is even higher because readers put more faith in editorial than advertising. By the way, I asked the Better Homes and Gardens reporter how she heard of me and she said the magazine's editor told her to call me for the home staging story! That's the power of marketing and why I put so much emphasis on it throughout the Staging Diva Home Staging Business Training Program. I'm a featured expert and quoted throughout the new FabJob Guide to Become a Home Stager or Redesigner. Staging Diva Graduate Lauren Bartel is also included. Learn more about the FabJob Guide to Become a Home Stager. It's interesting to note that the full page profile on me in the book is exactly the text I sent them. Learn how to write about yourself. Wayne Kelly of KBS Radio has asked to feature me in the coming weeks on his morning radio show. I'll be providing his audience with my insider tips on how to get the most m0ney when they sell their homes. Of course I'll work in a plug for the Staging Diva Directory of Home Stagers and the NEW Staging Diva Home Stager Locator Service. The interview date hasn't been finalized yet, but I'll keep you posted! The publisher of a newsletter in Deer Creek Estates in Crowley Texas contacted me for a home staging story for their newsletter to 400 homes in their subdivision. Naturally along with my tips I encouraged readers to visit the Staging Diva Directory of Home Stagers or try the new Home Locator Service! This publisher found me from the Six Elements website. There's a marketing idea for you here. Why wait for people to come to you? Are there any areas you could target with your own content? You write the text but someone else pays for printing and distribution! A growing number of reporters are grabbing their stories right off my websites without even interviewing me. If any of you see me in a local paper or magazine, I'd appreciate you letting me know! I'd be happy to send you a thank you gift in exchange for a copy of the story!